The 44.2 metre motor yacht Fighting Irish listed for sale by John Cohen at Merle Wood & Associates, has been sold with Yannis Zagorakis of Hargrave Custom Yachts introducing the buyer. Built in GRP by US yard Westship to a design by Jack Sarin, Fighting Irish was delivered in 2004. An impressive interior in satin finished cherry wood with burl accents accommodates 10 guests in five cabins. These comprise a full-beam master suite, two doubles and two twins. All cabins have entertainment centres, Samsung television screens and en-suite bathroom facilities. There is also accommodation for eight crew in four cabins. The saloon has been designed to facilitate the free flow of guests and includes comfortable furniture, a wet bar, ice maker and an entertainment centre featuring a 42-inch Samsung television screen. Forward is a dining area with seating for 10 guests. The aft deck is really an al fresco extension of the saloon, with tables, chairs, a bar and a 42-inch Samsung plasma television screen, while up on the flybridge there are sun pads, a dining area, Jacuzzi, bar and barbecue grill. Twin 2,2750hp MTU diesel engines give her a cruising speed of 16 knots and she is fitted with Naiad zero speed stabilisers. 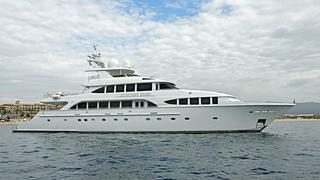 On the market for less than 60 days, Fighting Irish was asking $5,995,000.